Affairs of the heart are complicated and the anatomy even more so. Understanding blood flow, atrium and ventricle walls as well as the electrical system is not an easy task for the uninitiated. 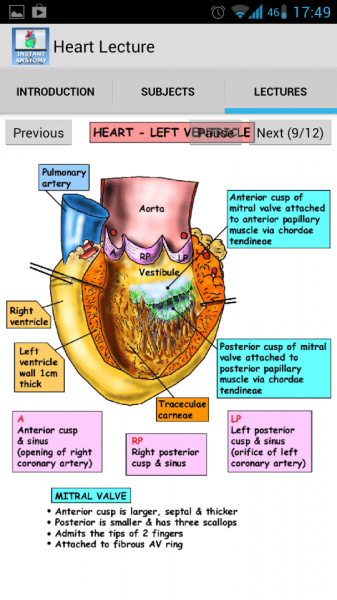 Anatomy Heart Lecture is part of the video podcasting series called Instant Anatomy. Dr. Robert Whitaker, a pediatric urological surgeon who teaches at Cambridge University (UK), walks us through the heart’s anatomy. Upon launching the app we are greeted by a simple introduction which briefly provides information on the author and his credentials. The Subjects tab directs us to a screen that simply contains the item Heart and Pericardium. We assume that this tab was originally thought of as a menu to direct users to either other parts of the series or perhaps even further subcategories within the present one. However, as it stands today, it simply leads us straight to the Lectures tab. 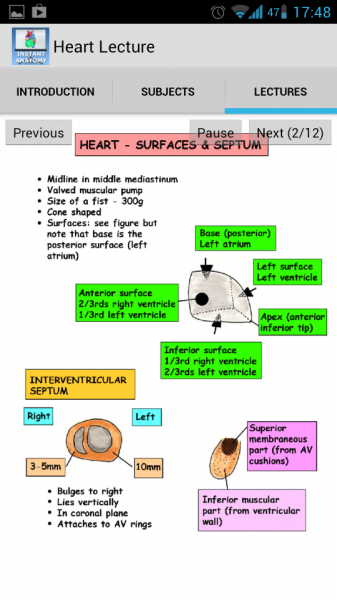 The lectures are composed of 12 slides displaying drawings on the different areas of the heart as the author narrates. The narration is very clear and allows for comprehension, though the drawings are just scanned images. 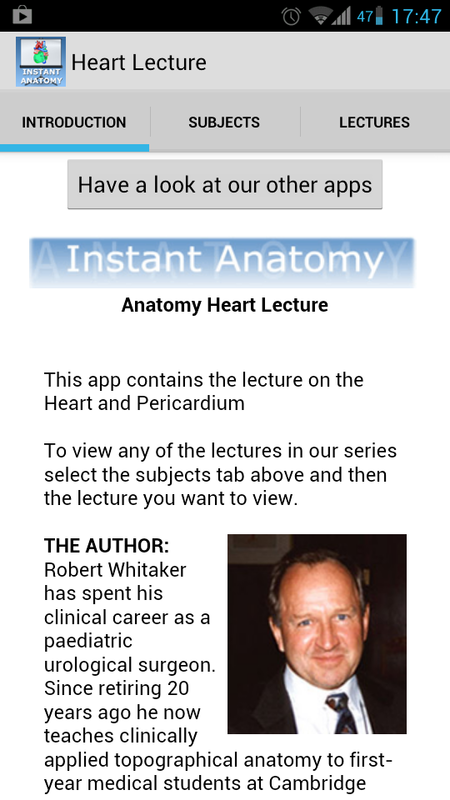 Anatomy Heart Lecture might be a good app for someone who prefers to listen to an explanation while commuting since the narration is clear and concise. The visual aspect of the app is quite lacking and doesn’t provide extra information. It would seem that the app is a direct port from podcast to podcast container and has little added value.